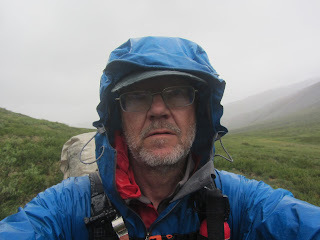 I ran into an interesting story about Buck Nelson and his trek along the Brooks Range. Nice inspiration at this time of year. Buck Nelson lives in Fairbanks, Alaska. He is a retired smokejumper who spends a lot of time in the wilderness. Ten years ago he hiked the lenght of the Appalachian Trail and last year he added the Continental Divide Trail to his Triple Crown. 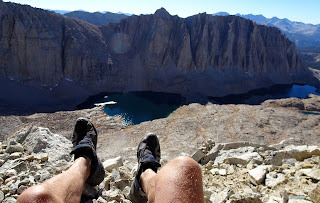 In between he had hiked the Pacific Crest Trail, but also done something quite a bit wilder. In the summer of 2006 he walked 1100 miles (1770 kilometers) across Alaska on his own. He flew into the eastermost part of the Brooks Range, close to the Canadian border and then hiked west until he hit the headwaters of the Noatak River. 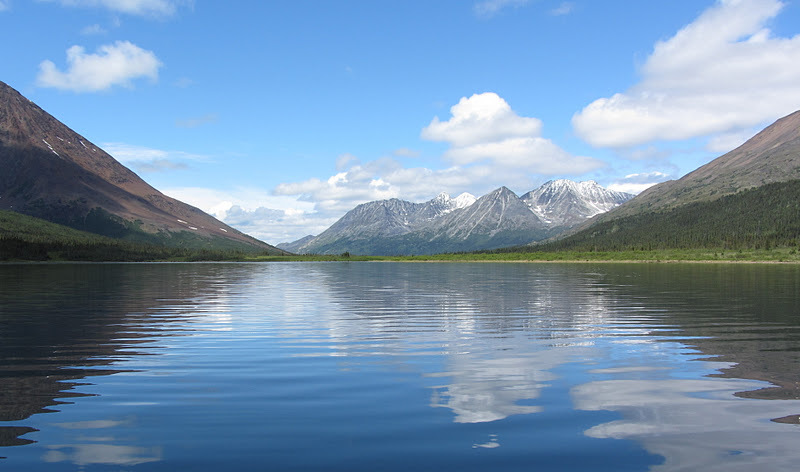 At the cache there he picked up a rifle, inflated his canoe and made his way to the Bering Strait and Kotzebue before winter set in. Buck is a lighweight backpacker, probably more or less as ultralight as is safe to be while walking "Alone Across Alaska". Check out his webpage at http://www.bucktrack.com/ and the teaser for his video below. To be recommended. His webpage looks so 1990s that I closed it right again. I have no interest in his content if he can not bother to have a easy to read website. Yes, that's snobbery. No, I don't care if I miss some good content. Nice catch Jorgen, i don't know how you find all this good stuff! Grow up Hendrik. People don't have to keep up with facebook or tweeter to express themselves. I came across this site before. Jörgen: Very nice find, thank you! Good stuff, although there is some merit to Hendriks comment on the design (it was awful) I still think "content is king". Some of the best material I've read has come from some of the worst websites. Buck should try out the wet feet concept. His bad experience with Gore-tex lined boots is far from unique. I've heard lots of people claim that the membranes fail after a short period. Lars Monsen for example. +1 on the REI Sahara shirt. Excellent fast drying shirt and cheap too. So now it is proven. Henrik is a childish blogging adventure-wannabe. Come on! Thanks for the mention, Jörgen. The look of my website is dated, no doubt about it. I plan to update the layout in the coming months. Gustav, you are probably right about the wet feet concept. I've actually gone that route quite a often on other long hikes and will likely use that method on my next long Alaska trek. I think many of you would feel quite at home in areas of Alaska. Good luck with your adventures. Guys, a website does not need to be shiny, new or anything - it needs to be easy to read and navigate. If it is difficult to navigate and read, then sorry, but I move on. If one invests time to write great content, make sure that that great content is also easy to consume. It takes less time than writing the content up. Anonymous, if you leave childish comments insulting others without having the honour to do so under your real name, what makes you that? A sorry little being. I think this page (which is a brief journal of the trip, with photos) should be easy to navigate and read. You can just start at the top and read down. Thank you Jörgen for bringing Buck´s adventures on deck. I received his great DVD on the brooks range traverse some weeks ago. I do like his travel style weather it is considered UL or L or what ever and I guess he knows quite well how to behave in a world beside web design, blogging and gear reviews..
@Buck Nice to see the author himself pop by here too. Alaska is dream for me. Your adventures are a real inspiration. With three small kids my adventures are mostly on a smaller scale nowadays, but one day I will go. You would probably enjoy Scandinavia as well. It's possible to go hunting in Sweden on state grounds almost for free (about 35$ a day). Ptarmigan hunting, on skis in winter, and with bird dogs in summer, is a fantastic experience. And you don't have to worry about those grizzlies. That will be my next adventure. Buck, please excuse my possibly harsh first comment. I visited the link you posted, and after changing the window size of my browser it was OK to read. Without re-sizing the text stretches across the whole screen - and while it is only 13" big it makes it still difficult to read. It is also a bit sad that the photos are all so small, and one needs to click them to see only slightly bigger versions of them. You might want to consider to not stretch the text out as wide as a browser window is, and limit it to e.g. 90 characters per line (that's the maximum used in books). The white text on black background also makes not for the most eye-friendly reading experience, so you might want to consider to inverse it. Other than that it was a nice read! More time spent out in the wilds doing something or more time spent at the computer sharing and presenting something? I think Hendrik and Buck are perfect examples of the extreme ends of this spectrum. Both should continue doing what they are good at, because they do it well. They could probably learn a thing or two from each other's websites (if they take the time to read them), like most of us who fall in the middle have. I updated my site to make it a little more appealing. Still have some work to do, but I think it's an improvement!